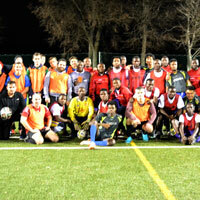 Webster Vienna's soccer team organized "friendlies" against PROSA, a high school team of asylum seekers, and NAFA, a local African football academy. In preparation for the upcoming Webster European Cup in April, Webster Vienna's football (soccer) club tested their mettle with "friendly" exhibition matches against local opponents. Two seven-man teams squared off on an unseasonably warm night against PROSA, a high school team consisting of asylum seekers, and the experienced squad of NAFA, a local African football academy. Though not all Webster players could make the event on an unseasonably warm December evening due to academic commitments, the squads enjoyed some spirited competition on a fun night for all involved. Student residence supervisor and Webster football coach Tanju Cengiz arranged the matches, which represented the first such friendlies Webster's football club has undertaken as it preps to battle teams from Webster's other European campuses. See match details in this story at Webster Vienna, and see photos in this Facebook album.